Even though I’m sure the film’s producers would have been happier had this film been a huge hit in theaters, it actually helps the viewing experience to enter the story knowing as little as possible. This also limits my ability to reveal the true direction of the narrative, beyond the basic setting and characters. I will just say this about the film’s hidden themes; they fit with this year’s emphasis on social messages, specifically those regarding gender issues. And so, it begins to make more sense why Close is winning awards for this film, even if it isn’t the most impressive of her career. The attention this performance is being given during award season seems to be making up for the past, in more ways than one. Though the themes must remain somewhat hidden, the initial set-up gives nothing away. The film begins with author Joe Castleman (Jonathan Pryce) receiving a phone call, informing him that he will be awarded the Nobel Prize for his body of work, much of which was created during his 40-year marriage to a former student, Joan (Close). As the couple travel to Stockholm for the ceremony, the film sporadically flashes back to give us glimpses of their relationship’s beginning. Piece by piece we are able to understand the workings of their marriage, and how crucial it has been to Joe’s career. Despite the supposed joyousness of the event, there are many external factors that continue to prevent Joe from reveling in his accomplishments the way he would like. First is the uninvited arrival of a biographer (Christian Slater) who has long desired to write an official book on Joe, much to his annoyance. Joe also clumsily navigates his relationship with his grown son, David (Max Irons), whose desire to be a writer often puts him at odds with his successful and constantly critical father. But the real troubles come from Joe’s own shortcomings, a glutton for base pleasures. When he isn’t indulging on whatever delicacy is offered to him, he dines on the attention of young women that fawn over him. 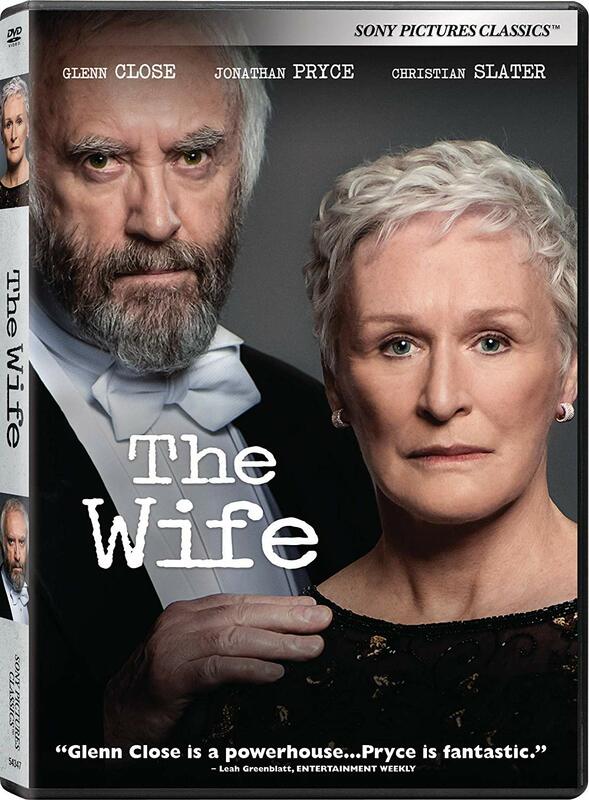 The Wife is a quiet mystery that slowly unfolds. It isn’t a mystery in the traditional sense, as there is no killer to unveil, but there is a puzzle to solve. The mystery at the center of The Wife seems to be figuring out what has made Joe and Joan’s relationship work for 40 years, and whether or not it will continue. It is a simple premise, though the execution is far more complex. If only due to the lavish setting of the film and the scope of time the film covers, The Wife is actually quite ambitious. Production values aside, however, The Wife is still a quiet film compared to most award contenders. 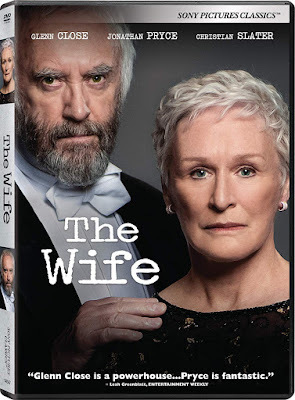 The DVD release of The Wife contains a few special features, all three of which help in promoting Glenn Close. It is a little strange that so little attention is given to Pryce’s involvement in the film within the special features. There is a featurette that exclusively looks at Close and her character, as well as a Q&A with the actress and the author of the book the film is based on, Meg Wolitzer. The last extra is a conversation with the main cast members of the film.